I read the blurb that accompanies this book which details how Clarissa is becoming scared of Rafe who doesn’t take no for an answer, wherever she goes he is there. There is something about stalkers that fascinates me. What is the motivation to keep trying to be with someone who doesn’t want to know? All this is made much worse because she works with Rafe, so she can’t totally avoid him. When Clarissa is called for jury service she is relieved, could this be a form of sanctuary from Rafe for a couple of weeks? I was hooked from the first page of this book, Clarissa is following the advice she has gleaned from the leaflets about stalkers advise, write down everything so many of the excerpts are from her notebook, small so that she can carry it everywhere with her. As the excerpts hop backwards to the time Clarissa first met Rafe we also learn of her lost love Henry, her longing for a baby and her love of sewing. You can almost taste the crisp cold air in London as she makes her way backwards and forwards to the court to listen to the evidence of a female witness who Clarissa can’t help but imagine a connection with, both are helpless and unable to turn to anyone for help. There are some great characters in this book, the other jury members, the witnesses and the defendants, the prosecutors and the judge were all distinct people with just enough background detail for me to feel I had really met them but not so much that it slowed the pace of the story down. It is easy to distinguish the present day, the main part of the book covers seven weeks of Clarissa’s life, from the written notebooks by the font which meant that this was an easy read despite the jumps in times and place. The tension in the courtroom at times nothing to that which is felt as she tries to continue with her life at the same time as trying to shield those around her from knowing what is happening. This is a five star read despite the fact that I felt a little disengaged at the end, not strongly enough to be severely disappointed, but after such a good beginning which didn’t dip throughout, the ending felt a little contrived. Despite this I would recommend this to everyone (except stalkers) who enjoy a good read with a storyline that makes you question how you would react? What is the right response if someone won’t leave you alone? This book is due to be published by HarperCollins on 24 April 2014, I received an advance copy through Amazon Vine in return for my opinion. Would you categorize this book under thriller? And is it written entirely in first person? This is definitely a thriller, Clarissa is being stalked by Rafe, a work colleague plus we have a glimpse at life in court at the trial where she is a member of the jury. It is mainly written in the first person. You are very welcome (again) Karen. This is definitely worth a read! Ooh sounds like a great thriller. Glad to hear it was a five star even if the ending wasn’t as great as the beginning!! Thank you Lauren, I really enjoyed this book even though I wasn’t quite as gripped by the ending it is one of those books that truly delighted me! I totally agree, at least serial killers seem to have an aim, I’m not quite sure what a stalker truly thinks their aim is. Clarissa relies on the advice from leaflets, much of which is contradictory, and tries to put it into practice. You read this and think that sounds sensible but this is one of those complex issues that defies reason. 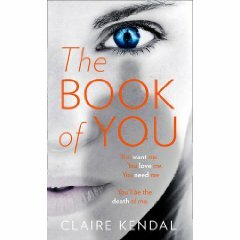 I really enjoyed this, I loved the scenes in court alongside the stalker storyline… a brilliant debut from Claire Kendal… can you tell I enjoyed it? OMK! Sounds like a great book (fur napping on)…if I can snag it from the dang human…..thanks fur posting!!! Going to get this one! (purrs)! Oh good…that means the dummy will have to FINALLY settle down in one spot fur a minute so I can get in her lap!!!! (purrrs)! That’s what I thought… see how well you help me? Your reviews do a great service. I just posted my review and completely agree with you about the ending but well worth the read. A real page turner and will be perfect for a summer read. I really enjoyed this one and enjoyed the courtroom scenes too. I have already recommended this one to several people, stalkers are quite a hot topic at the moment.